As your iTunes Library grows, you will probably lose track of exactly what media you have already imported and eventually you will end up with duplicate songs and videos. For example, you might accidentally import a CD twice or add files from Limewire or BitTorrent. Or maybe a friend with a big Terabyte hard drive loaded you up with a lot of music recently. Why is finding duplicate iTunes songs useful? Having duplicate music files on your computer causes more problems than just annoying the user. Duplicate songs can take up valuable hard drive space and bog down your computer speed! Many people don't think about how much having multiple copies of songs can really affect your system. Whether you've downloaded music or imported songs from CDs, you may have a few duplicate tracks causing clutter in your iTunes music collection. iTunes Duplicate Finder is designed to find and delete duplicate songs or tracks in your music library. Not only it finds them but it also allows you to safely remove them, thereby reclaiming space on your hard disk. It will find and clean duplicate music in your iTunes library. 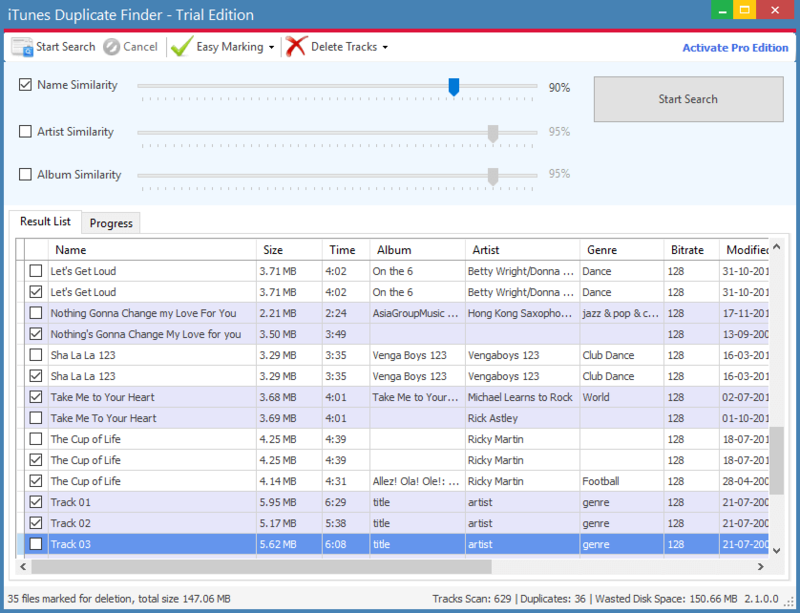 Organize music in your audio library with a powerful, intuitive interface. Increase free space on "limited" resources, like iPod, Mp3 Players and Flash Disks. Enjoy an organized music library. Lessen backup size and time. P.S: Duplicate songs in your iTunes Library can be a pain, but they can be taken care of with a little patience and know-how. Whether or not you use iTunes to manage your duplicates or an alternate option, you should always exercise caution before deleting your music. Try iTunes Duplicate Cleaner, and you will be amazed by all those unnecessary duplicate songs that reside on your computer. And, you can delete them with confidence, without having to compare them visually or by some other means.